Ghanaian hiplife rapper, Medikal’s mother has finally disclosed something about her son’s life and the death of colleague dancehall artist, Ebony Reigns. For the years spent in the music industry, Medikal has not been seen with his mum anywhere in public but that changed over the weekend at the One-Week celebration of Ebony. 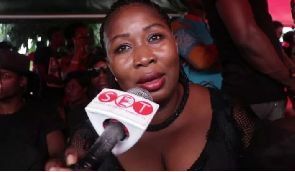 The woman who was identified as Porshia Lamptey speaking in an interview with Spyderlee Entertainment TV disclosed at the one-week observation of the late dancehall diva that she had always supported her son and his friends with prayers. Madam Lamptey speaking on the death of Ebony further revealed that since the demise of the dancehall artiste, she has never been herself. According to her, she feels Ebony is always with her in her room. “I’M A FAN OF MY SON MEDIKAL BUT I LOVE EBONY BECAUSE SHE’S AN UPCOMING ARTISTE JUST AS MY SON. I FELT SO BAD WHEN I HEARD OF HER DEATH. IN FACT, FOR ABOUT FOUR DAYS, I WASN’T MYSELF BECAUSE I LOVE HER. THE WAY SHE DIED, I JUST COULDN’T STAND IT. FOR THE FOUR DAYS, I COULDN’T SLEEP IN MY ROOM BECAUSE IT FELT LIKE I WAS STAYING WITH EBONY. I WAS FEELING AS THOUGH I WAS UNDER THE SAME ROOF WITH HER,’ SHE SAID.